MOORESVILLE, N.C. (Feb. 20, 2017) – Shane Lee has got a lot to look forward to this season if the rest of the year shapes up to be anything like Daytona. In his first race in the No. 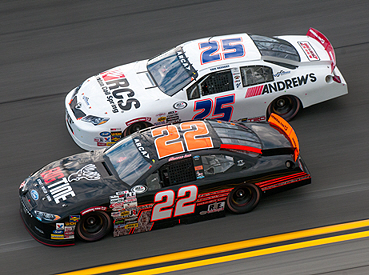 22 Big Tine Ford Fusion for Cunningham Motorsports (CMS), Lee came away with a career-best finish of third on the 2.5-mile superspeedway in the Lucas Oil Complete Engine Treatment 200 Driven by General Tire. Lee didn’t have the position he’d hoped for at the start of the race, lining up 19th out of a full field of 40, but quickly made moves to get within the top-ten with teammate Dalton Sargeant not far behind. After pitting under caution for fuel only on lap 22, Lee found himself restarting 16th. It didn’t take long, though, to get back to the front of the field and midway through the 80-lap race, the No. 22 Big Tine Ford Fusion was within the top five, and eventually took the lead for one lap before coming back under caution. Cautions continued to play a major role throughout the night. Lee and teammate Sargeant were never quite able to line up right during the restarts to be able to work the draft and move to the top before the race was called under a red flag. Despite not ending the night in victory lane, crew chief Paul Andrews said while the cautions didn’t exactly play in their favor, it was good to see Lee and the No. 22 car come out strong for the season-opener. Now the attention turns from superspeedways to short tracks as the next race for CMS will be the Music City 200 at Fairgrounds Speedway Nashville in April. Until then, to stay up-to-date with all Cunningham news, follow along on social media through Facebook (@CunninghamRace), Twitter (@Cunningham_Race) and Instagram (@CunninghamRace). Be sure to also keep up with Shane Lee by following his social media on Facebook (@ShaneLeeRacing), Twitter (@ShaneLeeRacing) and Instagram (@ShaneLee_00).